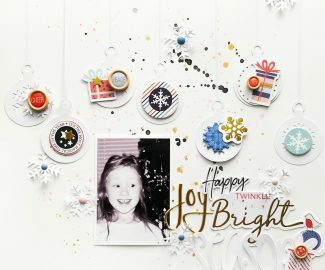 This week at the Hip Kit Club my assignment was to only use the main kit from June 2018! The kits are packed full of goodies so it definitely makes it easy! I decided to make a spread in my scrappy Traveler’s Notebook! I decided to go with a grid design and chose 2-3 colors to work with, when there are so many choices I find that choosing a scheme up front helps me get something made! I focused on the warm tones from the Pinkfresh Studio Simple and Sweet collection. I added the Vicki Boutin stamp from the June 2018 Color Kit to the Pinkfresh frame. Love this stamp set!! 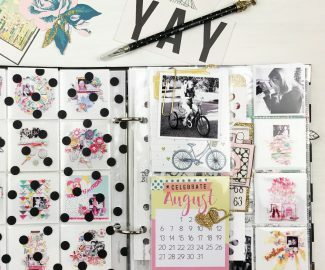 I did dip into the June 2018 Project Life kit for two of the cards, I couldn’t resist the sun card and sweet floral print. The cards are great in TN for their small size patterns.